I see basil, chives and rosemary and what looks like tomatoes and peppers. And your classic garden sculpture. Is she some sort of a goddess or something? Oh, and Allie says "why yes, I *am* a goddess, in fact. Thank you for noticing!" Errhhh could it involve a bit of nip or two???? Have a tremendous Thursday. we counted 16,942....chomp....wait, 16,941 ♥ !!! Hmm, did you temporarily change your name to Herb, Allie? MOL! 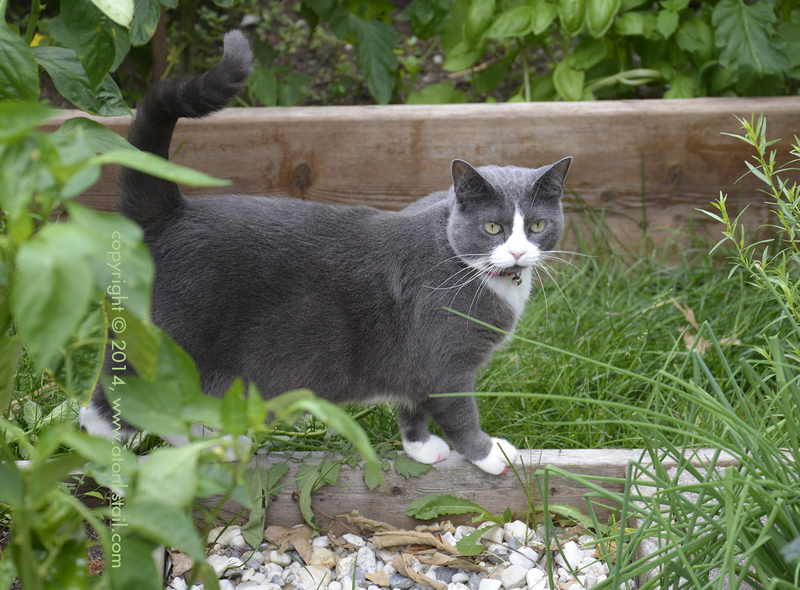 My human is lousy at IDing plants, even in an herb garden, but I do see one spicy kitty! ummmmm...what's an herb??? Doesn't it just come in a bottle??? How should I know who is named Herb? Allie all we could concentrate on was you! So where's the catnip? That's what Allie wants to know. Typist recognised Basil - she's a bit rubbish. I worry about the plants in her care!! Why Allie... you are looking positively radiant in the garden! ...careful, you don't want to mess up that fab mani-pedi! Allie, are you getting... exercise? ?